Language is a living, breathing phenomenon that informs culture. Individual and societal identities are forged through the spoken and written word. It is a unifying force, “an invisible line from the heart into the past,” as Art Napoleon, a First Nations cultural educator of the Cree Nation, describes it. Warm greetings in a variety of First Nations languages welcome you upon entering the “Language Forest” of the First Peoples’ Our Living Languages exhibit at the Royal B.C. Museum. The exhibit began in June 2014 and is now a permanent feature at the museum in Victoria. The atmosphere is inviting and understated, infused with a kind of humility and graciousness so often associated with First Nations people. In another display is a map projected onto a wall that displays the various regions and dialects of First Nations languages in British Columbia. Each region corresponds to a button you press in order to highlight that region of the map. Most of the 34 First Nations languages in British Columbia are no longer spoken or understood. In a display called “Latch Keys,” there are two keys that children of the Schools of Sorrow (the Kuper Island Indian Residential Schools) made out of a kitchen spoon and sardine cans in order to break into the food stores because they were starving. In a small theatre in the middle of the exhibit, you watch a video that explores how a separation from land was the beginning of language loss. Because First Nations people identify so strongly with their relationship to the land and the natural world, the language structures that arise from this intrinsic relationship were compromised when the people were uprooted from their natural territories. The video also reveals hopeful measures to help these languages flourish again. 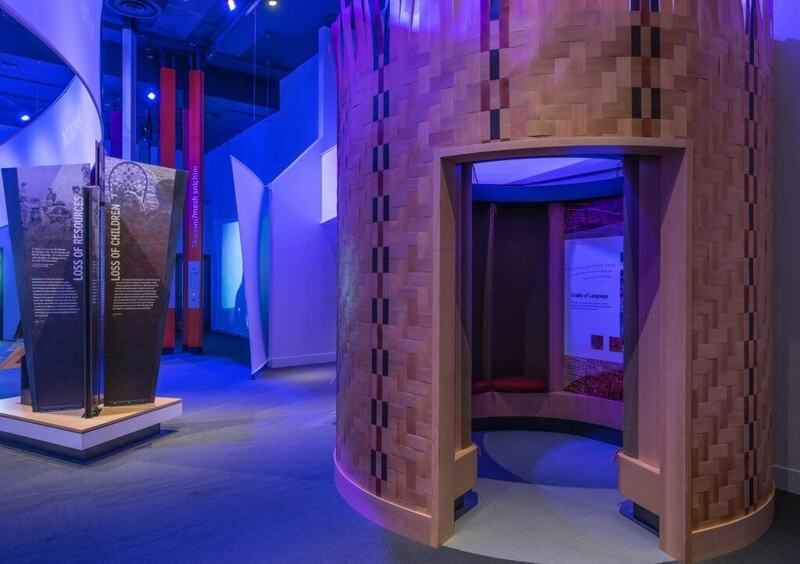 The “Cradle of Language” is one of the final components of the exhibit. It is a softly-lit cocoon-like space where you sit and listen to lullabies and stories. It is an enchanting finale to a beautiful expression of First Nations resilience and courage. The words are haunting and mysterious, imbued with a kind of paradoxical despair for what has been lost, yet hope for what still may come.